(Los Angeles, CA – March 21, 2017) The Los Angeles City Council today honored Mexican actor Mauricio Ochmann with a certificate of honor to thank him for his work to help pass the End of Life Option Act in California that took effect last June. The law gives mentally capable, terminally ill adults with six months or fewer to live the option to request a doctor’s prescription for medication they can decide to take to die peacefully if their suffering becomes unbearable. 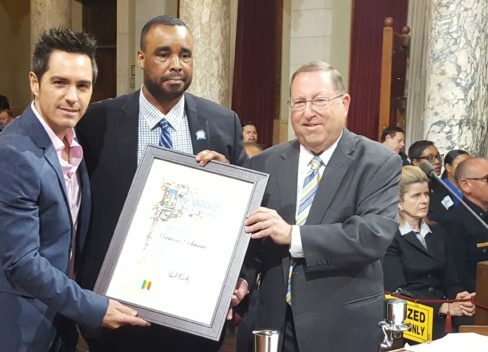 LA Councilmember Paul Koretz honored Ochmann, known as “Chema Venegas” in the popular Telemundo telenovelas El Chema and El Señor de los Cielos, during today’s meeting at Los Angeles City Hall. Civil rights activist Dolores Huerta and Edward James Olmos, actor, director and civil right activist, were honored in absentia for their work generating support for the law by lobbying and advocating for the bill. The Los Angeles City Council was one of the first municipal legislative bodies to unanimously pass a resolution in 2015 to support the End of Life Option Act, giving critical political support when the bill’s prospects for becoming law still were uncertain. Since 1988, there were seven failed attempts to authorize medical aid in dying in California via ballot initiatives or legislation. Latino support played a key role in enacting the End of Life Option Act that authorized medical aid in dying in California starting last June. A poll released by the Institute of Governmental Studies at the University of California in Berkeley in Sept. 2015, one week before lawmakers passed the End of Life Option Act, showed 75 percent of Latinos supported it. Hispanics are the largest racial group in California, totaling 15 million residents and 39 percent of the state’s population, according to Pew Research Center. “I know I am going to die because that is a guarantee in life,” Ochmann added. “I don’t know when, but when that time comes, I have told my family and the people I love that I do not want to be connected to tubes, catheters and needles. I will endure the suffering until it is intolerable. Ochmann was the first celebrity in Hollywood to publically endorse the California campaign to pass the End of Life Option Act at a time when many Latinos were reluctant to engage in conversations about end-of-life care. In fact, Ochmann recently recorded a 15-second public service announcement in Spanish urging Latinos to support the passage of medical aid-in-dying legislation in New York, where 19 percent of the population, or 3.7 million people, are Hispanic. The video was recently featured by People en Español. CLICK HERE to view it. “Hi, I’m Mauricio Ochmann, and I support Compassion & Choices’ death-with-dignity campaign because it’s my life, my death and my choice,” he states in the PSA. Medical aid in dying has been making headlines among Latinos in New York because of the new support for this end-of-life option by Assistant Speaker Felix W. Ortiz and Assemblymember Robert J. Rodriguez, and advocacy of recently deceased Miguel Carrasquillo. Miguel’s horrific suffering from terminal brain cancer prompted him to record videos in English and in Spanish to urge legislators across the country to pass medial aid-in-dying laws, including in his former home states of New York and Illinois, and native Puerto Rico. Miguel also recorded this this cell phone video on May 25, 2016, just 11 days before his agonizing death on June 5, 2016 (Spanish version of video).